Nearly $50 million is earmarked this year to keep Asian carp out of the Great Lakes, according the 2018 action plan just released by the Asian Carp Regional Coordinating Committee (ACRCC). The Great Lakes Restoration Initiative is providing $21 million of the funding. Last June, the Illinois DNR announced finding a single silver carp in the Illinois waterway, approximately nine miles away from Lake Michigan. The ACRCC has also been behind Asian carp harvesting and has set a goal of removing 15 million pounds of carp by 2022. In 2018, the directed use of contract commercial fishing will be increased to achieve even greater annual harvest of adult in Asian carp in key locations in the upper Illinois River. The following are summaries of the prevention actions and control measures that will be undertaken in 2018. 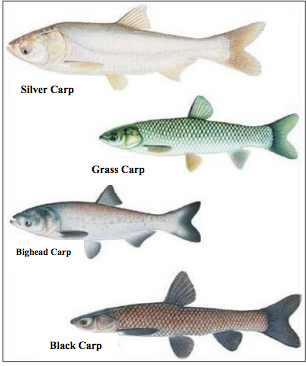 The term “Asian carp” refers to the following four species: silver carp, grass carp, bighead carp and black carp. Maintain the current barrier system operated by the U.S. Army Corps of Engineers (bypass barrier, electric barriers, and bar screens on sluice gates). Construction of a new electric barrier. Illinois DNR will continue contract fishing to reduce the number of Asian carp in the upper Illinois and lower Des Plaines Rivers downstream of the electrical barrier. Through this effort, more than 850,000 pounds of Asian carp are removed from upper Illinois Waterway annually, thereby maintaining or further reducing the estimated Asian carp populations. Asian Carp Enhanced Contract Removal Program Development. This project recognizes the value of increased harvest of Asian carp in the lower Illinois River by removing a goal of 8 million pounds by 2019 and a short-term (five-year) vision to achieve 15 million pounds removed by 2022. Use of underwater sound. Underwater sound technology is one candidate deterrent that may be integral to the prevention of Asian carp, which demonstrated effectiveness in laboratory and pond settings. Previous studies have indicated that both bighead and silver carp react negatively to sound. These studies have documented that Asian carp repeatedly respond to various underwater sound stimuli while many native fish species responded little to that same sound. The U.S. Geological Survey (USGS) and USFWS will complete studies of CO2 as a fisheries control chemical. Data will be collected to help determine the feasibility of CO2 as an Asian carp control tool. Additionally, outcomes from the engineering, architectural designs, and construction process are expected to result in conceptual procedures for implementing large-scale CO2 injection systems at navigational locks. Scientists have finalized a targeted toxin (antimycin) in the form of a coated micro-particle with high specificity for bighead and silver carp. Partner agencies will continue to implement a comprehensive Great Lakes basin-wide early detection and monitoring program for Asian carp. The ACRCC members are 27 state, federal and Canadian agencies, including the Wisconsin Department of Natural Resources.